A huge virtual vegetable shop appeared in the Shinjuku subway station in Tokyo on August 31, 2015. 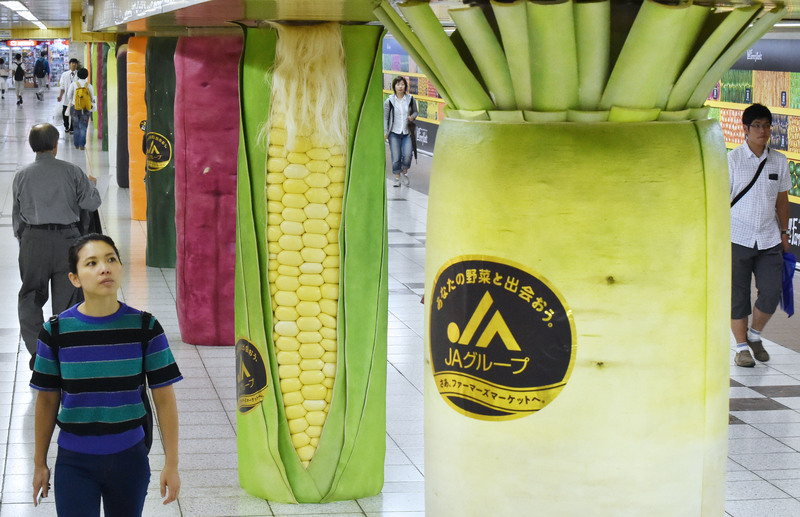 Several vegetable shelves printed on huge posters were put up on the wall and three-dimensional wraparounds featuring a Japanese radish, corn, sweet potato, and three other vegetables were set up around the columns in the walkway. In Japan, August 31 is “the day of vegetables” because of the similarity in pronunciation of 8, 3 and 1 to the word “ya-sa-i (vegetables)” in Japanese. The creative display that started on the vegetable day was a campaign presented by JA (Japan Agricultural Co-operatives) Group for promoting vegetables grown in Japan. Many including families and foreign travelers enjoyed the display even by touching and taking photos. The most exciting part was the 2-meter-high 15 vegetables rising from the floor to the ceiling. They were all recreated with a great attention to detail such as cut surface of leaves of a Japanese radish, shiny corn silk, and bumpy skin of a cucumber. 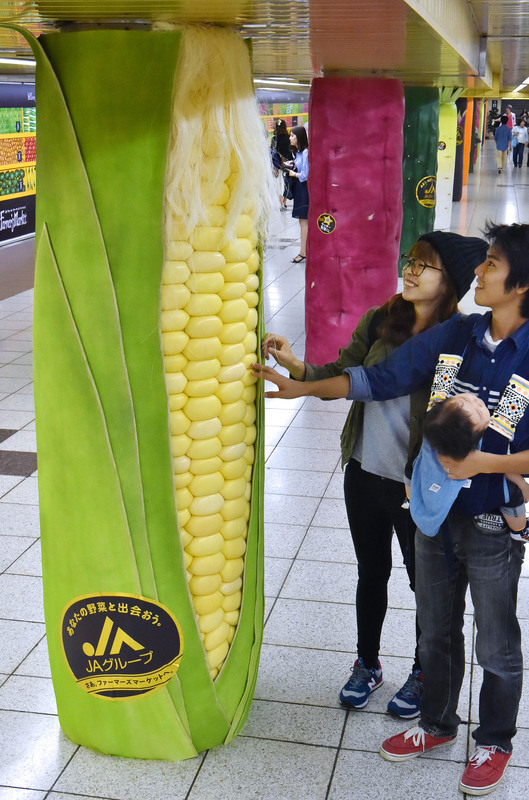 The 80-meter-long veggie shelves printed on the posters belonged to a virtual veggie shop named “JA Wall Farmer’s Market.” There were 20 kinds of vegetables on the “shelves” each with a two-dimensional bar code (QR code) and pedestrians are invited to use their mobile or smart phones to read them and get connected to the Internet shopping site “JA Town” to buy vegetables grown in Japan. A 49-year-old mother with her children was holding up her mobile phone over one of the QR codes. “I can buy vegetables, looking at pictures on the wall. This is very interesting,” she said. The “shop” was opened in the Metro Promenade in the Tokyo Metro Marunouchi Line Shinjuku Station, near the A10 exit. It ran from August 31 to September 6, 2015. This entry was posted in Cooperatives, Food & Agriculture, Photos and tagged News. Bookmark the permalink.